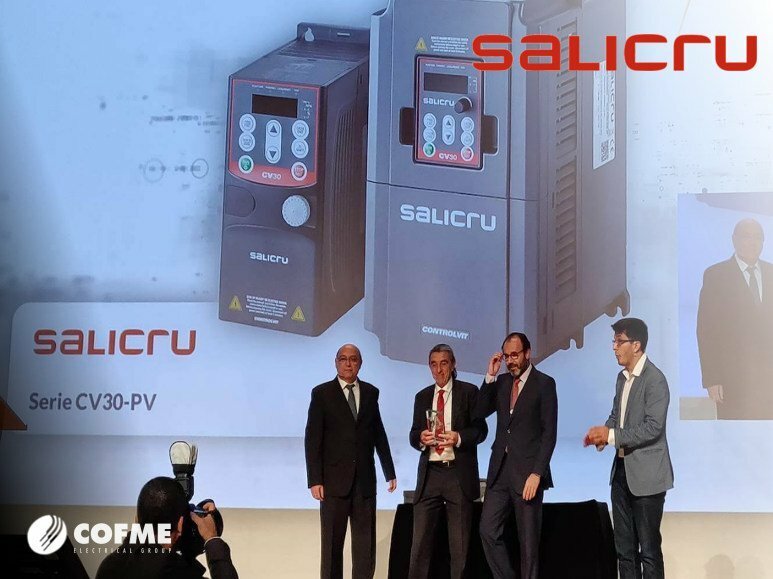 The CV30-PV series frequency inverter for solar pumping from SALICRU, specialist of the COFME Group in Power Systems, received the award in Madrid last November 13. The CV30-PV inverter is powered by light energy transformed into direct current by solar panels. Connected to a submersible pump, it supplies it with power in the form of alternating current so that it can draw water from the ground. The water obtained can be stored for later use or used for direct irrigation. This device is ideal for installations requiring reliable hydraulic supply, cost-effectiveness, long service life and low maintenance costs. Its commitment to sustainable development makes it an environmentally friendly product, as it does not produce pollution or noise. It is also applied to domestic consumption in isolated areas, water supply in livestock, fish farms, municipal and forest irrigation or control of desert areas. It provides efficiency, by tracking the maximum power point of the solar panels; economy, by having automatic start and stop depending on the solar radiation; easy configuration; resistance, by having multiple protections against overvoltage or overtemperature, and versatility, by allowing power supply via the electricity grid or diesel generator through the installation of an optional module.